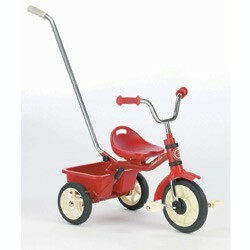 Cruise around all day long on the 10" Transporter Classic Tricycle! The retro classic tricycle offers an adjustable seat so that it can grow with your child along with a removable push bar! This cool new trike also features a brake bar and a front free wheel.